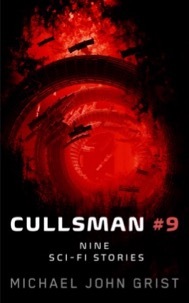 Cullsman #9 is a collection of 9 science fiction stories that chart the untamed outer fringe of existence, filled with ruined intergalactic civilizations, lonely globe-roaming robots, and a memetic virus that could destroy all things. Would you kill a world to save your family? In the depths of space, the cannibal planet the Host hunts. With its own resources depleted, it ‘hooks’ other living worlds through an immensely complex process called the ‘Cull’, mining them and their people to destruction. Now the Cull is coming. 9 ‘Cullsmen’ will be chosen, to prepare 9 potential planets – using and upgrading each world’s own technology and infrastructure to prepare an enormous metal hook at the pole. But this Cull is different from the others. This time 8 planets have failed already, and on the last, a terrorist organization threatens the Host’s very existence. How many must die for the Host to live? Just downloaded your book. Can’t wait to read it! I’ve been reading your book in bed at night (thanks to a back lit kindle :)) I’ve loved it. It’s so atmospheric like your Haikyo photography. Both are excellent. Some of the stories made me think of Laputa castle in the sky. Have you seen that film? I really enjoy it. I’m sort of reluctant to finish your book because then I won’t be able to read it unless I go back to the beginning of course 🙂 Just wanted to tell you how much I am enjoying it but I seem to have written rather a lot. That’s excellent Katy, thanks so much for letting me know! About the Laputa connection, I think the Giant Robot story definitely has that kind of feeling. Perhaps some others too? I do like Studio Ghibli. I’ll be putting out another collection of short stories in a month or so, so perhaps you won’t need to reread the Bells collection ;). The new ones will be fantasy/weird genre. I’ll send out another email announcing it’s on free promotion for the release. Could I trouble you for a favour? If you could add a review as above to the book’s amazon page, that would really be amazing. Thank you! I have gladly written a review for you and I’m looking forward to reading your next book. I also like studio Ghibli films but they are a lot less prevalent here in the UK. I have seen a few in Japanese with English subtitles and a few dubbed into English. As I don’t work I have been attempting to teach myself Japanese. I’d like to get a more authentic feel for the films. I also have a strange fascination with abandoned theme parks so I spend ages looking at your photos. It seems so strange that they’d just be left complete. I seem to have written rather alot again. Sorry.